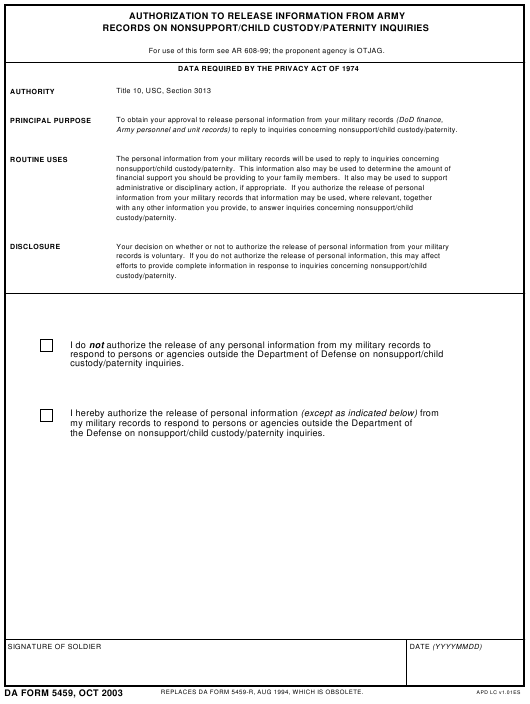 DA Form 5459 - also known as the "Authorization To Release Information From Army Records On Nonsupport/child Custody/paternity Inquiries" - is a United States Military form issued by the Department of the Army. The form - often mistakenly referred to as the DD form 5459 - was last revised on October 1, 2003. Download an up-to-date fillable PDF version of the DA 5459 down below or look it up on the Army Publishing Directorate website. For use of this form see AR 608-99; the proponent agency is OTJAG. Army personnel and unit records) to reply to inquiries concerning nonsupport/child custody/paternity. the Defense on nonsupport/child custody/paternity inquiries. REPLACES DA FORM 5459-R, AUG 1994, WHICH IS OBSOLETE.